When we think of the words "fuel efficiency,” terms like "hybrid,” "plug-in hybrid,” and "electric vehicle” all typically come to mind. But modern gasoline-engined vehicles are also more efficient than ever, some more so than others. So which is the most efficient? That would be the Mitsubishi Mirage. The Japanese automaker has confirmed its subcompact sedan, sold as the Mirage G4, and hatchback are the most fuel-efficient gasoline-engined vehicles in America. The EPA has awarded the Mirage hatchback with a rating of 36/43 mpg city/highway. The Mirage G4 returns a slightly lower 35/41 mpg city/highway. 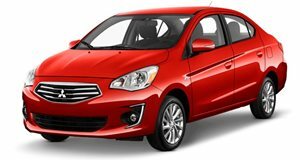 The government agency confirmed that the 1.2-liter three-cylinder-equipped Mirage has an ownership cost of $900 annually based on 45 percent highway and 55 percent city driving, current fuel prices, and a maximum of 15,000 miles yearly. 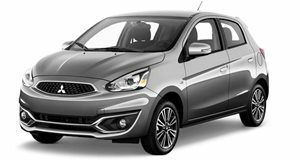 Pricing for the Mirage hatchback starts at $13,795 while the sedan is slightly higher at $14,395. Mitsubishi claims the sedan offers the most rear and total legroom in its class, while both body styles offer a lot of features for the money. These include a standard 7.0-inch touchscreen with Bluetooth, a rearview camera, steering wheel controls, and a USB port located in the center console. Apple CarPlay and Android Auto connectivity are optional. For 2019, all Mirage models add cruise control, a driver seat adjuster, and silver seat stitching. As for that three-cylinder engine, well, it’s not exactly the definition of powerful. Total output is rated 78 hp and 74 lb-ft of torque. A five-speed manual or a CVT directs power to the front wheels only. It also needs to be noted that the above fuel economy figures are CVT-equipped models. The five-speed manual reduces the figures by 2-3 mpg. Considering the average new car price is has peaked to over $33,000, the fact that you can still buy a brand new, high-quality and fuel-efficient sedan or hatchback for less than $15k is a very attractive proposition for those who simply require basic transportation around town.